His imagination was vivid when it came to the potential for accidents. It wasn’t enough to warn us not to run with the scissors; he would feel compelled to describe the violence sure to befall us if we did. “You’ll be running along and trip and fall and those scissors’ll ram right up into your neck or in your face and you’ll be screaming and you’ll pull out your eyeball and blood will be gushing all over the place!” It didn’t occur to my father that on some level of a child’s twisted psychology this sounded kind of cool. But it was also deeply insulting. Why would I run with scissors? Am I really going to be in that big a hurry to get back to my construction paper Easter Bunny collage? Notice how I didn’t bother to run with the glue? To help indoctrinate his children into the cult of fire safety, my father introduced us to Smokey Bear, a shirtless, grizzly forest ranger in blue jeans who cautioned young people about forest fires. I got to know Smokey pretty well. I was forced to attend organized fire safety events where the cautionary bear - some unlucky fireman elected to spend his day off sweating in a bear suit -would greet kids in person. 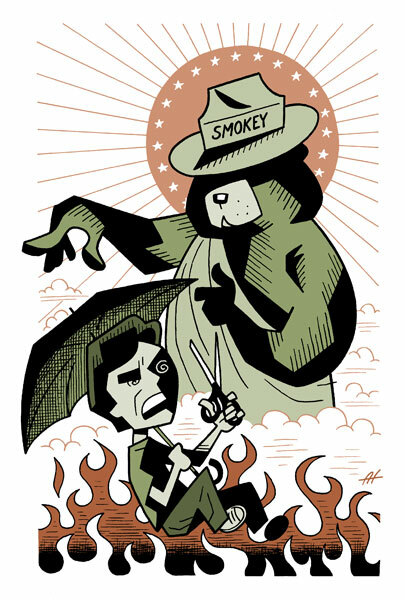 Smokey was a real downer. Meeting Spider-Man at the mall was all high-fives and witty banter, and hanging with Santa Claus held the promise of toys to come. But Smokey brought the party to a crashing halt with his authoritarian finger-wagging. Naturally, the first thing I wanted to do when I got the chance was play with matches. Obviously, if the adults are stressing the hazards this strongly, it must be really great fun to burn things. This was the problem. All this nervous-nelly obsession with life’s dangers had the opposite of its intended effect; my siblings and I engaged in all manner of stage-diving, fire-eating, and other intoxicated gymnastics just to spite our fretful father. We handled fireworks rambunctiously, we jumped off the roof with umbrellas (it seemed logical in theory), and when someone needed the scissors, we tossed them across the room like ninja stars. And yes, when I was a curious preschooler, one of the first manifestations of this reverse-psychology compulsion involved finding an unattended pack of matches one day and sneaking them outside to play with. I hid behind the bushes in the backyard, wary of the humiliation were I to be caught doing the very thing I had been warned was so dangerous. The absolute last thing I wanted was to prove my father right – his “I told you so” dance could last for weeks. So when I was certain that no one could see me, I struck a match. Instantly, as I gasped with a toddler’s idiotic excitement, the smoke from the ignition got sucked into my lungs. I hacked and coughed, my sinuses burning, alarmed that I might die of “smoke inhalation” (the first words I’d learned after “mama”). I knew this was the make-or-break moment for me in the construction of my moral compass - the karmic test - the moment that makes children learn to fear the retribution of the Almighty long into adulthood and onto the therapist’s couch. I was being punished by unseen forces. But for me, the sanctity of the moment was diminished by the Almighty’s resemblance to Smokey Bear. I could see him in my mind, judging me with his scowling snout. And like my father, Smokey the Bringdown knew nothing about fun. I struck another match. Within weeks, I had added an aerosol can of flammable liquid and plastic army men. Life was good. I grew up accepting to some degree that my father’s anxious admonishments were largely irrational, and that a life without the occasional headlong rush into danger isn’t worth living. My father, after all, simply had no faith in his children’s common sense. And I embraced this rebellious philosophy right up until the day when I was working at the public library, and a little girl of six walked up to the counter to ask me for a pair of scissors. I passed them to her, handle first, secure in the belief that this intelligent little citizen would emulate my example of their careful handling. She opened the blades wide and ran wildly across the room. Kids are idiots. My dad has always been Mister Safety around the house, but he has a few blind spots, one of which is fireworks. When we were kids and our family was shooting off fireworks together on New Year's Eve or 4th of July, my dad would always hold the roman candles in his hand as they went off, instructing us to do the same. I have a distinct memory of him putting a roman candle in my hand, showing me the right way to hold it, then lighting it. Nothing terrible ever happened, and I didn't think anything was wrong with that method. You should have seen Jeff when I did that on New Year's Eve- he just about burst into flames of pure anxiety at the sight of me holding a lit roman candle!